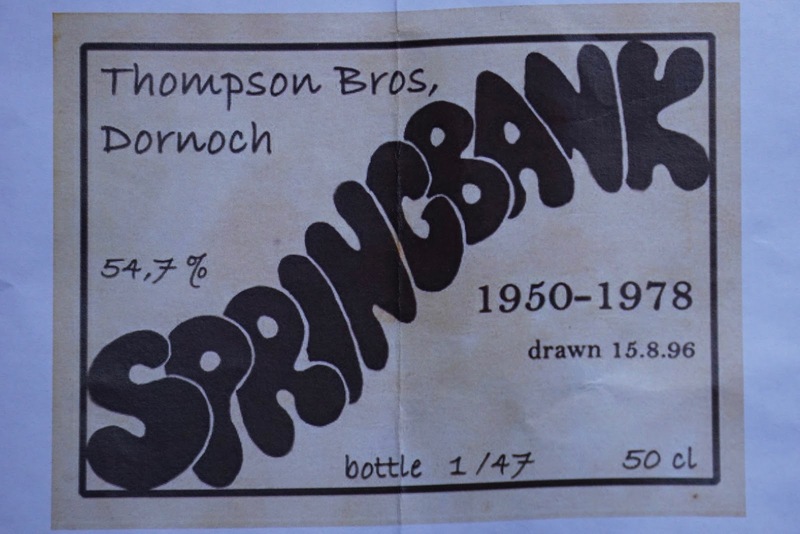 Springbank Dornoch Castle Vat 1950 - 1978 (54.7%): Well, unicorns do exist after all... This tiny sample bottle sitting on my desk is the solid proof for that. 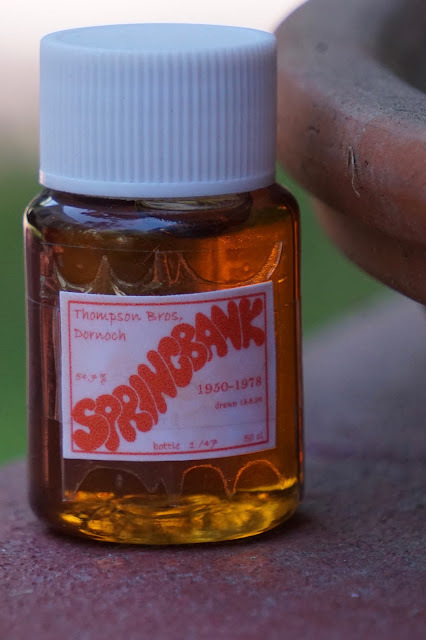 I don't know how but Ian Sunderland made it happen and it is indeed a sample of the legendary Springbank vatting of the Dornoch Castle Whisky Bar. Unreal... Cheers Ian..! The story of this whisky as we learned from Serge Valentin a.k.a. Whiskyfun starts witha firkin first filled in 1964 with Springbank whisky from Eaglesome of Campbeltown distilled in 1950. 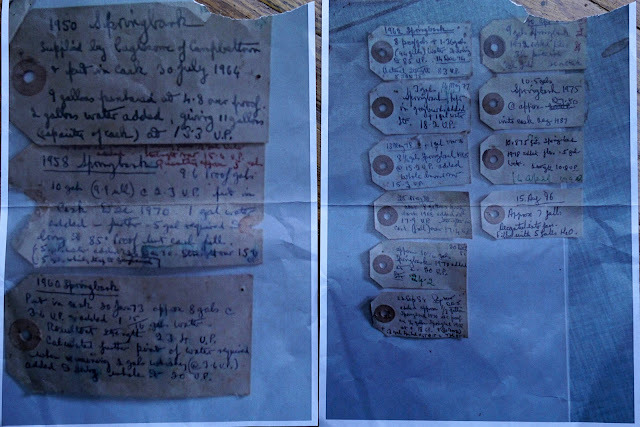 The cask was topped up with several other vintages (picture below) throughout 1978 and finally in 1996 the whisky got transferred to glass containers. 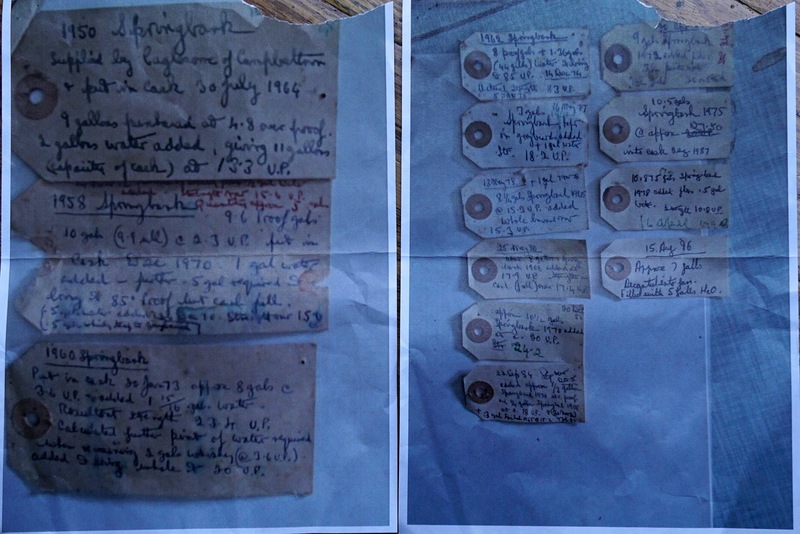 It is sold as miniatures exclusively at Dornoch Castle Whisky Bar so far I know if anyone is interested to get one. Color: Dark amber, wildflower honey with slow moving thin legs. Nose: Oh, boy... Where to start from..? Forest ground, moss and decomposing leaves. Campfire, industrial grease and mineral water. Decaying leather upholstery and dried mandarin oranges. Dried rosemary leaves and toasted pine nuts... Furniture grade cured hardwood and strawberries. Palate: Very gentle mouthfeel in spite of its abv. Wet tobacco, white pepper and some tartness like cellar aged Chardonnays. Blood orange and tart clementine slices and juniper. Crystallized ginger, poached apples and orange blossom honey. Salted butter, cinnamon and caraway seeds. Finish: Long, bitter and sweet. Herbal, piney and covered with toasted wood notes.